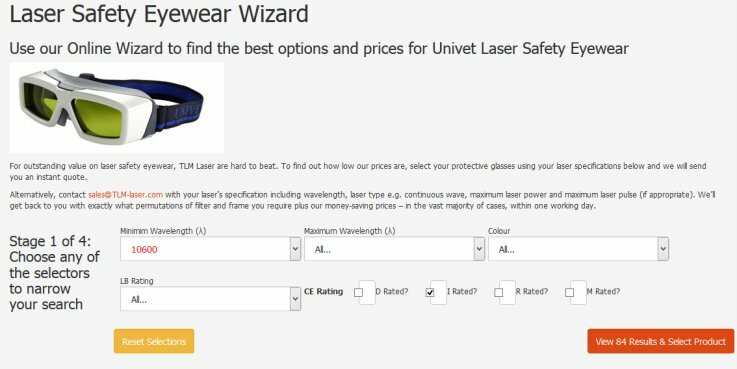 Find the right laser safety windows and eyewear with our new online wizards. TLM Laser is proud to introduce a new time (and money) saving feature to our site – our Laser Safety Eyewear and Laser Safety Windows Wizards. Now you can find the right protection for your laser system and see how low TLM Laser’s prices are – virtually instantly. To enjoy the advantages, go to the Safety section of the site and click on the appropriate Wizard tab. Using a short, step-by-step multiple choice process, just enter your laser’s specifications in terms of wavelength and LP/CE ratings, choose a colour and we’ll show you the options. Click on your choice, choose a quantity and a quote is yours. The Windows Wizard has a couple of extra categories to consider – glass or acrylic and the thickness you require. It really is that easy. If you’re happy with your quote and given the product is in stock, your safety windows or eyewear can be with you within 24 to 72 hours. Of course, you don’t have to use our website wizards. Instead you can contact TLM’s other ‘wizards’ at sales@TLM-laser.com with your laser’s specifications. If you’re not sure of the details, contact us anyway and we’ll use our expertise to find the right safety product for you.